Recently I’ve spent some time researching hats. I am not much of a hat knitting type. 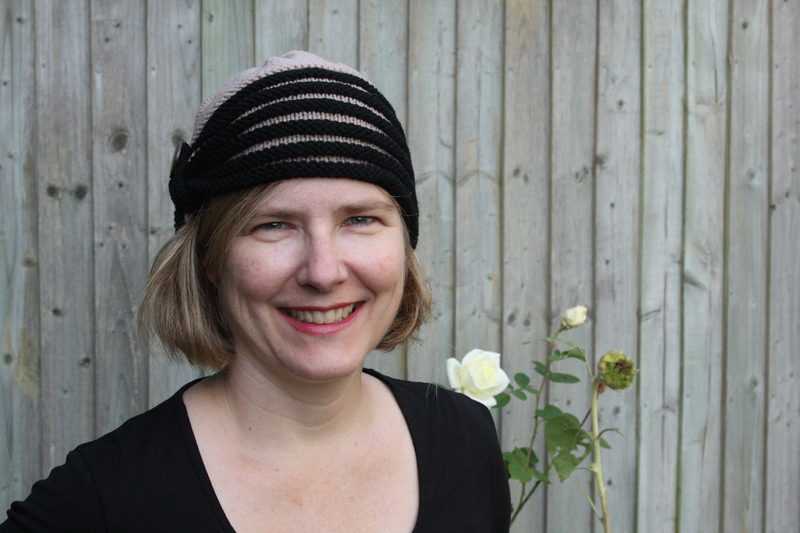 I did knit the beautiful Peerie Flooers hat, designed by the talented Kate Davies, which I documented on the blog here. But other than that, I don’t think I’ve knit many hats. I vaguely recall a few beanies knit flat in chunky yarn and then sewed together; these I made for various children, and were not pieces of knitted beauty. But because I am drawn to knitting sweaters, I don’t think too much about knitting hats (or socks or scarves or mittens for that matter). A few months ago, my friend Maria was diagnosed with breast cancer. She was, in her own words, about to get the “full meal deal” – surgery, chemo and radio. Maria lives on another continent. If she lived close by, I would babysit for her daughter and bake treats. As I live so far away, the only thing that I could think to do was to try to knit her some chemo hats. I started looking at hat patterns and reading endless forums on the topic. I found many of the hats that are designed specifically for people to wear during chemo are hats I really don’t like. Obviously, there are special criteria for chemo hats – they should not be remotely itchy, they should provide good head coverage, etc. But, I think that when you are feeling crappy and have lost your hair, that is not the time for a non-stylish hat. That is the time for a beautiful hat that lifts the spirits and feels good. Once you start to search, you realize that knitters all over the world are knitting thousands of hats, many of them quite beautiful, to give to mothers, sisters, girl friends, even total strangers, undergoing chemo. (Lots of chemo hats are knit for children and men as well. Cancer is an equal opportunity disease.) One of the more interesting observations I read online, in a Ravelry forum on chemo hats, was from a woman who had undergone chemo twice. She said that it was important to realize that the recipient was going to wear clothes while wearing their hat. It seems like a silly thing to say at first, but what she meant is that the hat should fit in with the recipient’s wardrobe. If you are making this hat for a person who only wears black, do not make a pink hat with flowers, she said; try to make something that suits their style. While knitting for Maria, I spent time thinking about her. I have a story to tell about her that readers of this blog may appreciate. Many years ago, when my children were little, Maria spent a summer in Berlin, doing a residency with a firm there. She had arranged housing for the summer, but this option fell through shortly after she arrived. We invited her to come and live with us for the summer. It was a completely lovely summer and we had many great times together. Maria always looked good. I mean always. Her clothes were so perfectly coordinated. She had outfits for every occasion. She always looked stylish. Everything always matched. She had arrived at our house with an ordinary suitcase. How could she always look so good, for a whole summer, living out of a single suitcase? When I asked her, Maria replied, “Oh, that’s because I make a list in advance of what I will pack.” “Well,” I replied, “I make lists, too, but I can never seem to pull off a travel wardrobe like you have.” And then she showed me her list. Maria pulled out a sketch pad. In it she had made a list of every single item of clothing, including shoes, jewelry, belts, etc that she packed for the trip. Following the list were pages and pages of sketches, each sketch showing a complete outfit, with all accessories included, made up of different combinations of items from the list. One sketch would show Maria in a flowered dress, with a little cardigan and pretty shoes and handbag. The next would have a pair of trousers, a blouse, and matching shoes, belt and earrings. I have never seen anything like it. The list was composed of 2-3 dresses, a skirt or two, 3-4 pairs of trousers, t-shirts, blouses, 3 pairs of shoes, etc; each item was designed to match as many other items as possible. She must have had a different outfit sketched for each day of the summer. I have never forgotten it, and never lived up to it. Every time I pack a bag I aim to be half as successful as Maria, and never manage it. I chose to make it out of Quince & Co Lark. This is a 100% wool yarn, and many would argue against using wool for a chemo hat, but it is a very high quality, extremely soft wool that I thought would hold its stitch definition, respond well to being washed and hung out to dry frequently, and would look nice. I bought it in Black and Taupe because I think that these colours will suit Maria’s wardrobe. 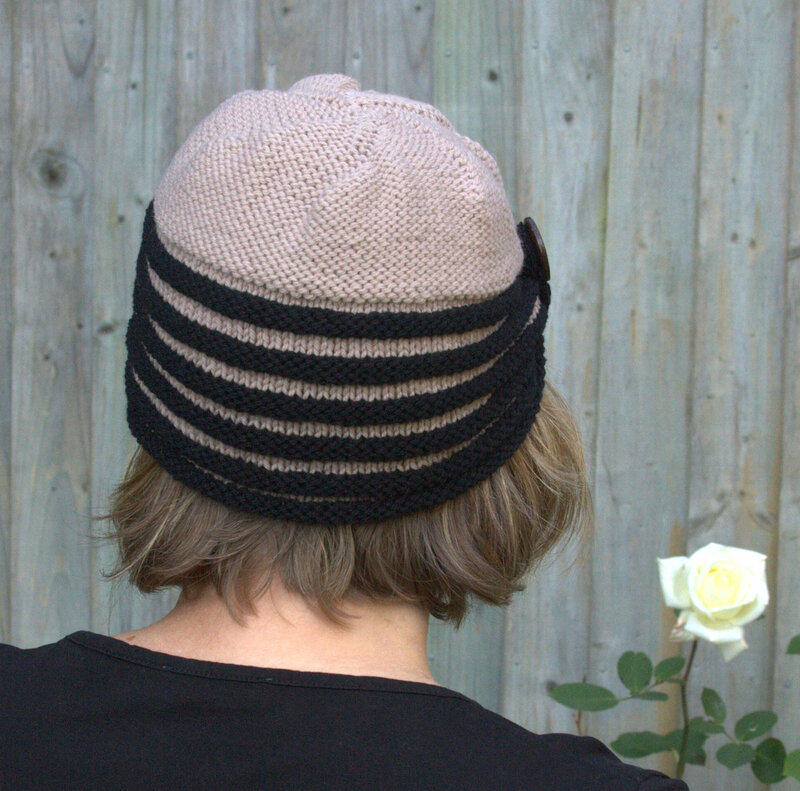 The hat is very easy to make, with an intuitive pattern. I took the finished hat to John Lewis and spent an inordinately long time picking out the button. I wanted to make two hats, and really struggled with the second. I wanted to make the second with a different yarn. I couldn’t find any cotton yarns that I was happy with. I finally settled on the Debbie Bliss Baby Cashmerino DK. This is a blend, 55% wool, 33% microfibre and 12% cashmere. It is machine washable (though not machine dry-able). I had it in my stash in bright red, but didn’t think this would be a good colour for Maria, especially while undergoing chemo, so I went out and bought some in a dusty blue, almost a grey blue. Even after picking out the yarn, I had a tough time narrowing down a pattern. 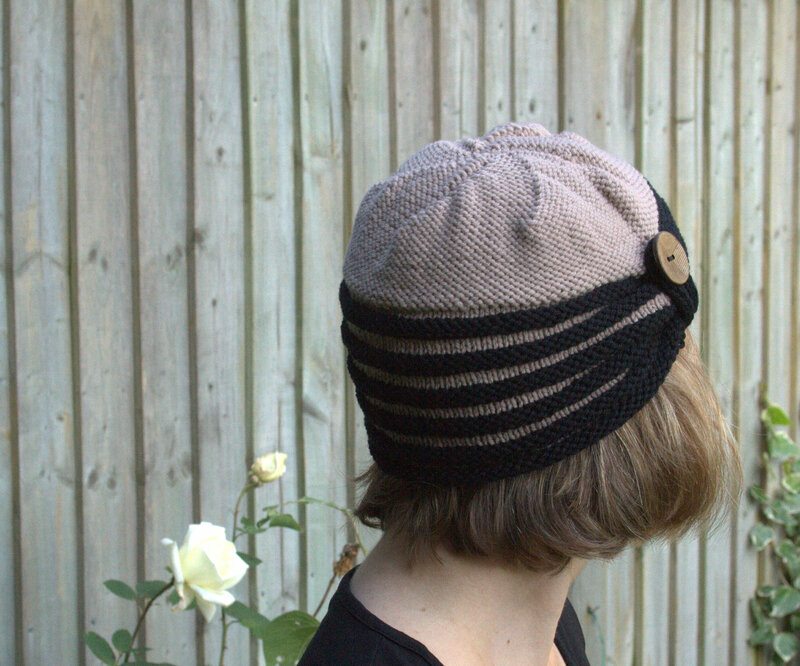 I finally decided on the Odessa hat, designed by Grumperina. It is a very pretty hat, simple but stylish. I liked that it was quite different than the Zelda cloche. 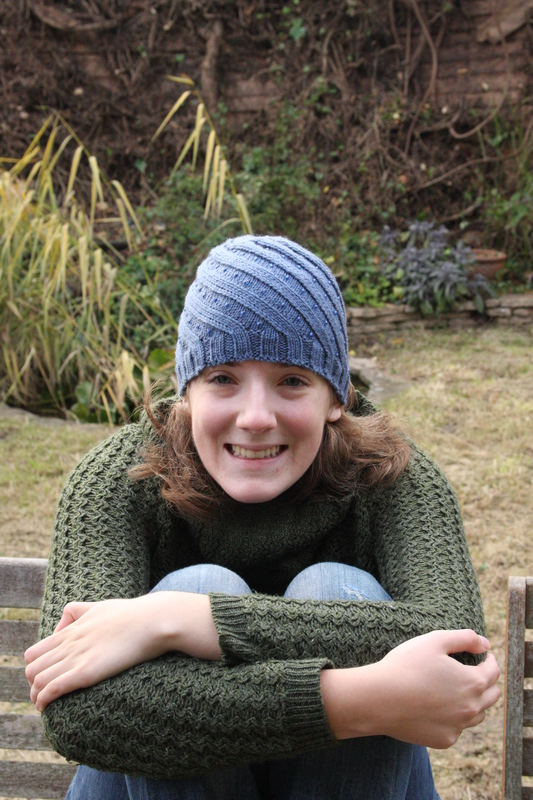 I wanted to knit very different hats, so that Maria would have options, or in case one didn’t appeal or feel right. Leah and I debated for a while about whether to include the beads or not. I was pretty sure that beads were not a great detail for a hat intended for use during chemo. Leah maintained that the hat was much lovelier with beads. I ended up trying it out, knitting a few inches with the beads. Yes, they looked really pretty, and they stayed on the outside of the hat, so that the inside remained smooth and soft (the Baby Cashmerino is really wonderfully soft). Leah is modelling the hat in these photos. 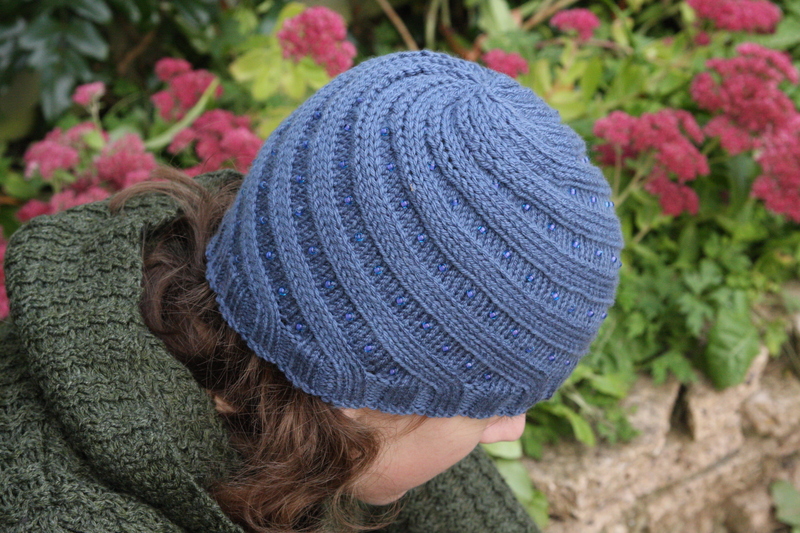 The Odessa hat is supposed to take one ball of Baby Cashmerino. I knitted the hat an inch longer than the pattern called for because I wanted to make sure it provided good cover. As a result of this, I used up a few yards of yarn from a second ball. Probably, if you don’t knit in some extra length you won’t need the extra ball, but I would suggest buying one anyway – whether you need it or not, you will knit easier for having it in reserve, and afterwards you can make matching gloves. If you know of someone undergoing chemo, a knitted gift is very comforting, for the knitter as well as the recipient. Though hats have an obvious function in this case, a soft shawl or blanket, or cozy socks can be just as nice. This entry was posted in Finished Project and tagged Alexis Winslow, Baby Cashmerino DK, chemo hats, Grumperina, Knitting, Odessa hat, Quince & Co Lark, Zelda cloche by knitigatingcircumstances. Bookmark the permalink. I wish all the best for your friend. The story you shared about her is great, it made me admire her as well.